Jorge J. Vega-Iracelay was born in Buenos Aires, Argentina. Currently, he is Senior Director of Legal, Corporate Affairs and Corporate Social Responsibility at Microsoft Mexico. Before relocating to Mexico, he had similar responsibilities at Microsoft for the Southern Cone Region, based in Buenos Aires, Argentina. In 2008, Vega-Iracelay was recognized with the Global Attorney Excellence Award by Microsoft Corporation while in 2010, he was granted the World Wide Circle of Excellence for his contribution in Corporate Social Responsibility in Argentina. Vega-Iracelay is a Visiting Professor in Corporate Law and Public Policies at Universidad Pan-American; he chairs the Innovation Task Force at the American Chamber of Commerce of Mexico (Amcham), Vice- Chairs the local chapter of the Business Software Alliance (BSA), and serves on the Advisory Boards of the Mexican Internet Association (AMIPCI) and Mamá Digital a non-profit organization. In the past, he served in the Board of CESSI (Argentinean IT Industry Association) and CICOMRA (Argentinean Telecommunications, IT and Electronics Association). He has contributed with opinions and interviews in major newspapers, as well as lectured, and wrote papers, on IT, CRS and Internet topics. He holds a Law Degree from the Universidad Católica Argentina. In 1995, he obtained a Master degree in Law (LL.M) from Columbia University (Nueva York) where he conducted an academic research in the subject of International Arbitration as a Visiting International Researcher. Jorge has taught Commercial Law and Commercial Contracts for 10 years at his Alma Mater, and he is a licensed attorney in Argentina, Spain and in Nueva York State, United States of America. 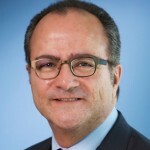 In addition to his academic work, Vega-Iracelay has worked for international law firms based in Buenos Aires, Rio de Janeiro and New York, and as in-house counsel and corporate affairs professional in companies such as Aguas Argentinas (a Grupo Suez subsidiary), Grupo Socma/Macri and Comsat International Inc. (a Lockheed Martin company), where he was VP & General Counsel, based in Mc Lean, Virginia, United Stated of America.